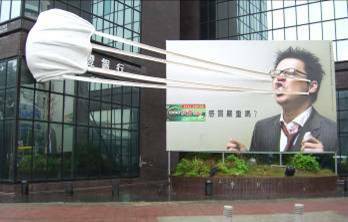 M!dea is an internal event amongst MindShare’s Greater China offices to celebrate great creative work. This year I was honored to be one of the judges and to have witnessed great work full of WOW factors. 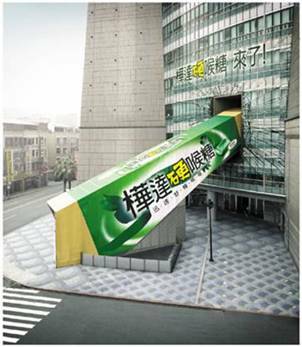 Amongst all the entries, I was particularly impressed by these two smart and effective outdoor solutions – for GSK brands Panadol and Valda Hard Candy – developed by the Taiwan teams which made them the twin Gold prize winners in this category. As The Big Switch gathers speed across Asia, and audiences increasingly tire of 30-second spots, these ‘ambient’ ads truly demonstrate how some inexpressible concepts like “serious cold” and “hard candy” can be executed innovatively and vividly with such stunning 3D impact that they “engaged with real consumers in an enjoyable and impressive way”, as the client (GSK) put it. Outdoor is generally deemed as a supplementary reach & frequency builder to mainstream TV advertising. These 2 striking installations however, have not only sparked talk-of-the-city interest, but have also generated tremendous free PR value and remarkable financial results. I think you are right that the audiences are increasingly tire of 30 seconds spots but we also cannot ignore those 30 seconds spots because 3D creation is very expensive as far as I know. TV media is something which cannot be ignored in future but we have to see that how can the cost of these 3D creativity be reduced because the market is growing rapidly and people need creative stuff rather than old 30- seconds spots.